“If you have come to help me, you are wasting your time; but if you have come because your liberation is bound up with mine, let’s work together”. So I’ve strived to work together, and in doing so I slowly came to realise that, although we have to work together, we have different work to do. I can’t do the Aboriginal work; Aboriginal people can’t do my work. 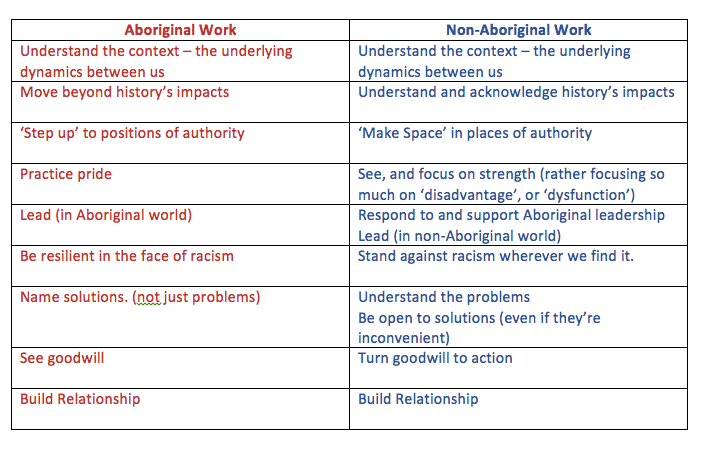 To help unpack this I developed, almost on a whim, two lists: ‘Aboriginal work/Non-Aboriginal work’. Then I discussed it with my Aboriginal colleague, Kim Bridge, and we revised it. The key point of the two lists is that each supports the other. If we, on the non-Aboriginal side, don’t do our work, it is exhausting – to the point of burn out - for Aboriginal people to do theirs. And doing our own work enriches our own lives and our shared society. I showed Jen the list, and she was taken with it. ‘I wonder what a list like this would look like in relation to gender equity – what’s women’s work; what’s men’s work?’ she asked. So we decided to develop a list, and began by each, separately, doing our own. Sounded simple. It wasn’t. I found I had all sorts of opinions on what men might need to do, but really couldn’t speak of what women should do. And of course, on reflection, this was right and proper. That quick draft was only possible because of 17 years of honest, sometimes difficult, dialogue with Aboriginal friends and colleagues. And it made me realise just how much I haven’t been a partner in the gender equity dialogue. I’ve been an observer – a supporter even – but not a genuine partner. So we both struggled, and that simple fact reinforced our interest in working together, and with other women and men, towards genuine and transformative partnership. My attempts at genuine partnership with Aboriginal people and movements have enriched me through fascinating, deep exploration of how we can be more fully human, together. I suspect that attempts at truthful, genuine partnership between genders, not just in our personal lives but in relation to cultural and structural change, might do the same. So Jen and I have started to engage others in the conversation about the different work that partnership might require (including in ‘Partners for Change’ workshops). Here’s some ideas from various people (including Jen and I) on what might be included in ’the lists’. It focuses on gender equity in the workplace. We would both be interested to hear your ideas about the different work that men and women can do, in partnership, to build genuine equity, knowing that ‘your liberation is bound up with mine’.